I am a very lucky girl. Over the past few weeks I have got to meet some fabulous people and gone on some terrific adventures, all thanks to my lil’ ol’ blog. Who’d have thought it. One of my favourite adventures is the day I went to Anna Scholz’s studio in London and tried on lots of her lovely designs. It was all down to the Plus London Two organisers – huge thanks to them for organising this – who arranged for us to go to Anna’s studio on the afternoon of the main meet, which was held in the evening. I met up with the delightful Mhairi en route and we made our way to the studio. We were obviously far too eager and arrived early, bumping into the very smiley Melanie along the way, and, as it was so cold outside, we decided to be brave and pressed the buzzer in the hope that Anna would let us wait in the reception area until the allotted time. I was in my element. So many beautiful clothes and room to browse through them – heaven! I just wish I had taken more pictures but I got so caught up in the moment that it went right out of my mind. I can’t remember how we got onto the topic of bras but it wasn’t long before I was showing Anna and Liz the Ewa Michalaks I had brought for one of my friends to try on (and the PL Czerwona Panterka I was wearing!). They were very impressed with them and made a note of Ewa’s website so they could find out more for themselves another time. 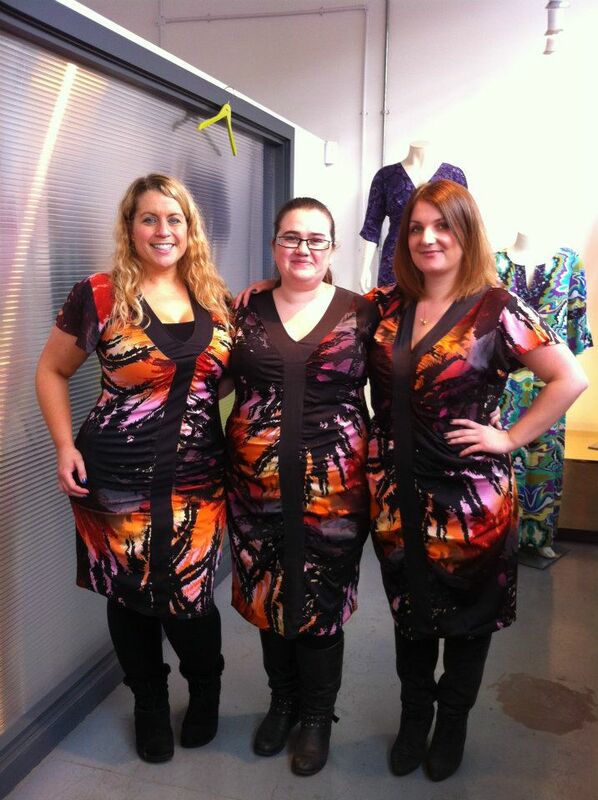 They were also very impressed with my gorgeous blue Wallis dress and spent some time looking at the shape and design. 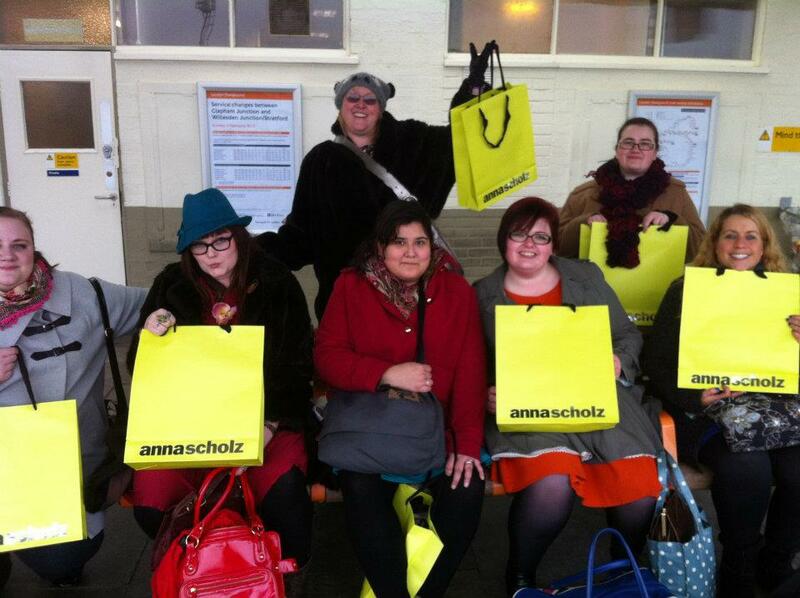 A short time later, most of the other bloggers (who had met up elsewhere beforehand) arrived. It was wonderful to see some familiar faces again (including some of those I met at the Gok Wan shapewear launch) and to meet lots of new ones. I was particularly excited when the wonderful Kathryn arrived and couldn’t help but attack her with a big booby cuddle. By now Anna’s team had prepared some refreshments – which, apart from a couple of drinks, I managed to miss out on, which was rather silly of me – and everyone had a great time admiring the beautiful clothes. 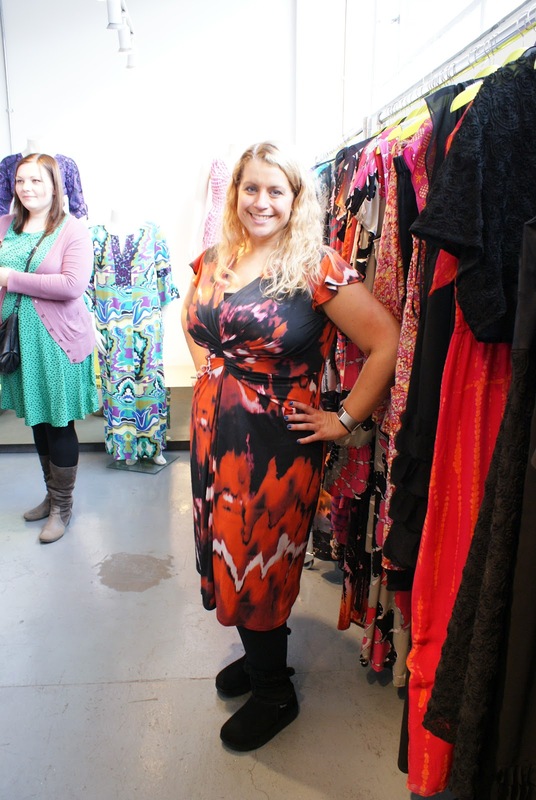 After a few minutes, Liz from Anna’s team came over to chat again and with a little encouragement from her we ended up trying on a vast array of dresses between us. I wish I could have them all! 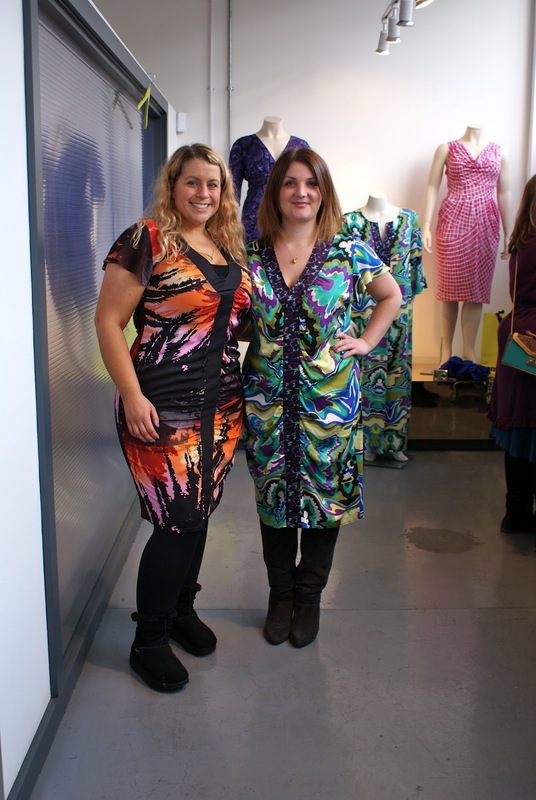 This purple snake print proved popular with us all – and was worn by Anna herself. 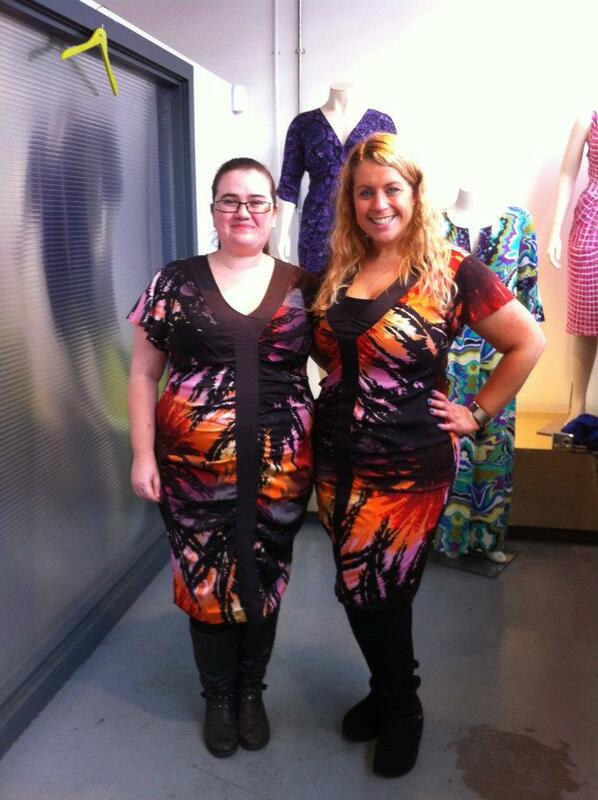 I totally adored this sunset print dress – and I love how these photos show how well the shape it works on ladies of different shapes and sizes. This is true of all Anna’s designs; they are flattering, stylish, comfortable and very wearable. I fell in love with this leopard print number – it gives the most amazing shape and could easily be dressed up or down. It wasn’t quite as eye-catching when it was on the hanger but I am so glad I tried it on so that I could see what a great dress this is. Finally, this dress was also a huge hit with me. This one is quite a bit too big – you can see it gaping at the back – but even so, you can see the fab shape it gives and how flattering the colours and pattern are. After much trying-on and chit-chatting, Anna gathered us all together so she could formally talk us through her collection. I really enjoyed this part of the visit as it was fascinating to hear her inspiration for many of her pieces – for example, the fabric design for the purple snake print dress was made from an enlarged photo Anna took of some real snake skin. After she had taken us through some of her favourite pieces, Anna gave us the chance to talk to her about the things we look for in clothing, and perhaps find hard to buy on the high street/internet. Liz did a great job of writing a list of everything we mentioned, which made me feel that they were really taking us seriously and that perhaps our thoughts and opinions might help to form future collections (although it is pretty hard to think of many ways to improve Anna’s designs!). At one point, the ladies were discussing leggings and Liz mentioned mine – the Maidenform/Sweet Nothings shapewear leggings available from T K Maxx for £9.99 – and before I knew it I was stood in the middle of the room with my dress pulled up and Liz peering down the back of my leggings to find the fibre content on the label! All too soon, our time with Anna came to an end and we headed off into the sunset. Her team had very kindly prepared a goodie bag for each of us to remember our day. Thank you so much Anna, Liz, Cliff and the other lady in the office who I didn’t get to meet. You all made us feel so welcome and at home – I think we could have easily spent another couple of hours with you at least! Oh, lots of pretty dresses!!! So weird thing… I keep trying to get blogspot to let me follow your blog but it doesn't like it for some reason and never shows up in my reader. Any clue what's going on?